New save system lets you save in up to five slots (the original Xbox 360 version supported only one). Cutscenes are 16:9; see the WSGF entry. 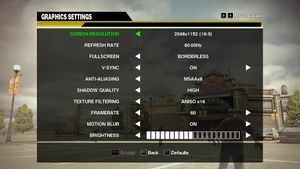 Frame rate cap can be configured to 30, 60 or Variable. 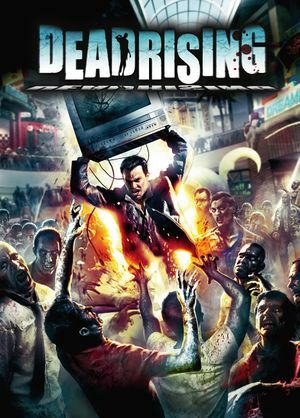 Download Dead Rising 3D Vision Fix. Press F3 to toggle the bloom effect (on by default). Press F4 to toggle the depth of field and vignette (on by default). Press F5 to toggle the lights in lamps (on by default). Natively supports Xbox 360, Xbox One, and PlayStation 4 controllers, with matching button icons for each. See Helix Mod: Dead Rising. ↑ 1.0 1.1 File/folder structure within this directory reflects the path(s) listed for Windows and/or Steam game data (use Wine regedit to access Windows registry paths). Games with Steam Cloud support may store data in ~/.steam/steam/userdata/<user-id>/427190/ in addition to or instead of this directory. The app ID (427190) may differ in some cases. Treat backslashes as forward slashes. See the glossary page for details. This page was last edited on 12 April 2019, at 22:59.